Looking pretty good for a guy with my eyelashes. I began my fifth chemotherapy session on the 27th of December 2010, two days after Christmas. By now all of my eyebrows and eyelashes had gone and I looked like a really rubbish alien! I mean if you're going to be an alien at least have some extra arms or something decent. Sarah was off Sixth Form for the Christmas holidays so she was coming to stay for a few days and arrived on the ward on the 29th. We spent one night in hospital before both returning back to mine after my chemotherapy had finished. I received more scan results in early January. They showed that my tumours had continue to shrink but I still had tumours in my lungs, on my pelvis and on my skull. Furthermore, because the tumour on my pelvis hadn't shrunk enough it seemed unlikely they would be able to perform surgery to remove it. I would instead be having radiotherapy to the area following my high dose chemotherapy. It was worrying to hear my cancer being discussed by the doctor. To hear him tell me what would and could happen to me. For him to tell me that even after all this treatment it could still come back and start growing again. If it does start to come back then any treatment would most likely be just buying me time. I live with the fear that it's going to come back everyday and it's always at the back of my mind. I suppose it helps me put things in perspective and encourages me to live each day to the full as much as I can. It was also pretty scary when he sat me down and told me there was a chance that the high dose chemotherapy might kill me in a number of ways. My organs could fail, I could pick up an untreatable infection, I could get brain damage, I could pick up a virus which could make me go blind, become paralysed or just kill me, I could react badly to the high dose chemotherapy and a million different other ways. At the very least they predicted I would be spending between 4-12 weeks in hospital in isolation. They hadn't seen it done in less than 4 weeks for over ten years. Many people end up spending up to 6 months in hospital. Some people never get out at all. I was starting to prepare myself for this high dose chemotherapy. I had never really been a fan of hospitals and was just able to bear the four days it took for my chemotherapy and I wasn't sure how I'd manage for at least 4 weeks. I was told I wouldn't be able to eat or drink for weeks at a time and I'd be fed through a tube. 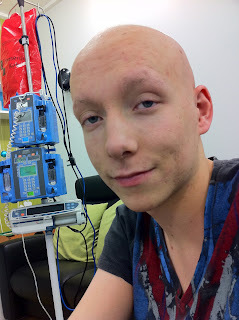 I had my last VIDE chemotherapy on the 18th of January 2011. I have no idea why but this last chemotherapy seemed to go on forever. I was unable to sleep for the entire four days and was so irritable all the time. I couldn't get comfortable anywhere and knowing that this was my last VIDE chemotherapy I wanted to get out so badly. After this somewhat hellish hospital experience I was so happy to be home! All I had to do afterwards was to wait until my bloods reached normal levels and then I would be nearly ready to start high dose chemotherapy in February. It felt fantastic to have finished my normal chemotherapy! I knew I had a lot to go through but I was proud to have come so far. I was so grateful to all my family and friends for supporting me so far. I'd made a lot of friends along the way too and was glad to have met so many amazing people. To paraphrase Churchill, I knew it wasn't the end. It wasn't even the beginning of the end. but it was perhaps, the end of the beginning.